You’re in the right place this weekend if you’re interested in festivals. Many of the top things to do this weekend July 20-22 are all things fair (carnival), fare (food) and fair (large). Of course, if you are interested in other types of events, we have those, too. Continue here for all events and activities happening in Lake County. Phew, that was a long week, we need a little sum’n and you probably do too. We’ve done the research and found some of the greatest summer libations in Lake County from our great breweries, wineries and distilleries. Thirsty? Without any further adieu, throw some burgers or dogs on the grill (July 18 was national hot dog day), and let’s look at the top things to do this weekend July 20-22! Venture to Century Park this weekend for the sights and sounds of the season at the Vernon Hills Summer Celebration. The summer “Cel” will feature carnival rides, a petting zoo, a car show, bingo, a bags tournament, various children’s activities and more. The live entertainment lineup is star-studded highlighted by Grammy-nominated country artist David Nail. Also, popular country group, the James Barker Band will grace the Vernon Hills stage. Other renowned live local entertainment includes Hello Weekend, King, Mike & Joe and more. Friday-Sunday; July 20-22. Fri.: 6 p.m.-midnight, Sat. : 1 p.m.-midnight, Sun. : 1 -10 p.m. Free admission. Century Park, 1001 Lakeview Pkwy., Vernon Hills. The legendary Lipizzan horses will blow out birthday candles this Saturday as Tempel Farms celebrates 60 years since the original 20 steeds were imported from Piber, Austria in 1958. The Old Mill Creek anniversary gala evening will begin with sparkling beverages followed by a special anniversary performance in the arena. After the routine, food, refreshments and music will be held at the stallion stables. Saturday, July 21; 5:30 p.m. Admission: $150. Tempel Farms, 17000 Wadsworth Rd., Old Mill Creek. Get a flavor of the season at Antioch’s Taste of Summer Festival this Friday through Sunday. 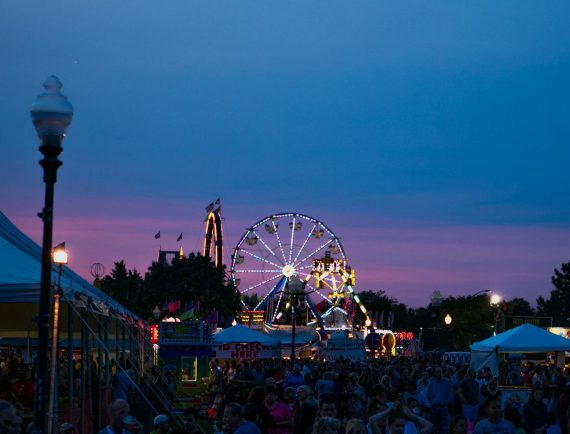 Bring the family to delight in delectable specialties from top area restaurants, carnival rides and games, sidewalk sales and live music from top artists such as BBI Live, Suburban Cowboys, Heartache Tonight, Modern Day Romeos and the Neverly Brothers in the Brook Bandshell. Friday-Sunday, July 20-22; Fri. & Sat. : noon-11 p.m. Sun. : noon-6 p.m. Free admission. Downtown Antioch. Meander through the streets of Lake Zurich at the annual Lions Club Alpine Fest this weekend. The event begins with the firefighters’ water fights on Friday night followed by three nights of carnival rides, games, food, family events and entertainment. The Alpine Fest Parade kicks off on Sunday at 11:30 a.m. and has become one of the largest parades in Lake County over the years. Friday-Sunday, July 20-22; Fri.: 6 p.m.-midnight. Sat. : 1 p.m.-midnight. Sun. : 11:30 a.m.-8:30 p.m. Free admission. Lion Fred Blau Park, 81 E. Main St., Lake Zurich. It’s a “Family Affair” at Ravinia Festival as renowned singer and songwriter, Mary J. Blige graces the Highland Park stage on Friday night, while the Chicago Symphony Orchestra (CSO) performs the Tchaikovsky Spectacular featuring the “1812 Overture” with cannons on Saturday and Sunday evenings. Blige has eight multi-platinum albums, a nine-time Grammy-award winner and a two-time Golden Globe nominee. The CSO is conducted by Ken-David Masur with Inon Barnatan featured on the piano. Mary J. Blige: Friday, July 20; 8 p.m.
Chicago Symphony Orchestra: Saturday-Sunday, July 21-22; Sat. : 7:30 p.m. Sun. : 5 p.m. Multiple ticket prices. Ravinia Festival, 418 Sheridan Rd., Highland Park. Celebrate Buffalo Creek Brewery’s first-anniversary party at their Muttersholtz Festival this Saturday. Muttersholtz, formally the name of Long Grove, features non-stop live entertainment. From noon to 10 p.m., the eclectic brewery will host a plethora of bluegrass bands including the Grateful String Band, Fox Crossing Stringband, Anderlik, Otto & Church and the Henhouse Prowlers. The Long Grove brewhouse is bringing in barbecue from BBQ’d productions, Steamboat BBQ and Chicago Culinary Kitchen for a competing for best pig roast. Tickets include admission, one plate of barbecue and one beer. Proceeds benefit the Long Grove Lions Club. Saturday, July 21; Noon-10 p.m. Admission: $30. Noon-10 p.m. Buffalo Creek Brewing, 360 Historical Ln., Long Grove. A dozen food trucks making a stop at the Lincolnshire Corporate Center on Friday. Fare aficionados gather at lunch break to choose their favorite eats at Lincolnshire’s Food Truck Fridays from the following vendors: Marty’s Eat Wagon, Rogue Curbside Kitchen, Mothers Truckn Good Food, Mario’s Cart, Best Truckin’ BBQ, Grill Chasers, Swirl Café, Toasty Cheese, Toasty Taco, Happy Lobster and Louie B. Fresh. The delectable three-hour affair feature a special live performance from Sipos & Young Band. The foodie event occurs every two weeks and runs through August 31. Friday, July 20; 11 a.m.-2 p.m. Free admission. Lincolnshire Corporate Center, 300 Knightsbridge Pkwy., Lincolnshire. Friday-Sunday, July 20-22; Fri. & Sat. : 7:30 p.m. Sun. : 2 p.m. Admission: $15. James Lumber Center for the Performing Arts at the College of Lake County, 19351 W. Washington St., Grayslake. For even more things to do this weekend July 20-22, continue here.